Our Projects – BDB Productions Inc.
BDB Productions Inc. is proud to announce that we have begun working on the remount of Judas Noir, an adaptation of the play ‘The Last Days of Judas Iscariot’ coming fall of 2018! Thanks to Obsidian Theatre’s Dark Town. Obsidian Theatre Company presents BDB Productions‘ Judas Noir from October 9-20 at Crow’s Theatre‘s Streetcar Crowsnest. Judas Noir is an adaptation of Stephen Adly Guirgis’ play “The Last Days of Judas Iscariot”. This story follows the court trial of Judas Iscariot, the disciple notoriously known for betraying Jesus Christ. While this case gets unravelled, parallels are drawn between the persecution of the Jewish people (during this archaic time), and Black citizens of today. This play deals with themes of: betrayal, regret, forgiveness, and the loopholes/flaws that exist in our justice systems presently, and potentially in the afterlife. Obsidian Theatre Company is Canada’s leading culturally specific theatre company. Obsidian is passionately dedicated to the exploration, development, and production of the Black voice. Its multi-pronged approach to supporting other Black theatres, and providing space for young directors to explore work exists under the Darktown banner. BDB Productions’ Judas Noir is the inaugural Darktown production. BDB Productions INC is a company founded by 7 artists of colour, with the desire to share thought-provoking stories through multiple mediums: Film, Theatre, Television, Web, etc. Their mission is to provide entertaining narratives that provoke the audience to do at least one of these three things: be moved emotionally, be stirred mentally, be inspired wholeheartedly. We at BDB Productions are excited to bring back this Play with its previous Director Leighton Alexander Williams at the helm, who will also be taking on the role of Satan. RoadMarks Goes to Post Production! We had an amazing month shooting our latest short “RoadMarks” Directed by Brandon Mcknight, our resident Director, Produced in association with Deelen With Trouble Productions, producer, Courtney Deelen. The film written by Adrian Walters starring himself along side Humberly Gonzalez, a CFC alumni. With Peter Schnobb as D.O.P. Upon completion of Judas Noir, we were back on set with Residue. A short film written by Leighton Williams, produced by BDB Productions Inc in association with YEAA Shorts, Shorick Entertainment, equipment sponsorship from William F Whites International and directing by, Shonna Foster. Its been an incredible getting to shoot in the summer, with principal photographer being done August 28th. 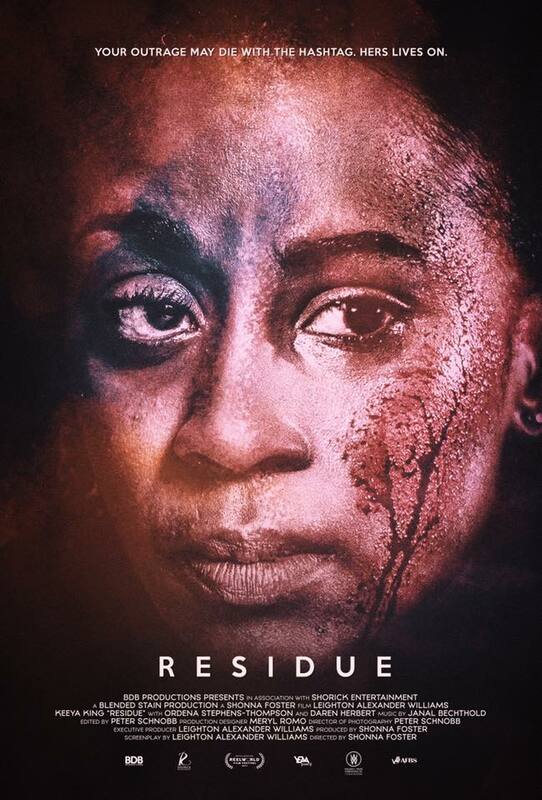 Currently, Residue is in post production, with its premiere at the ReelWorld Film Festival this October. The film stars storing female leads with a truthful and compelling story about the struggles of a mother in the aftermath of an incident involving her child. More to come soon. 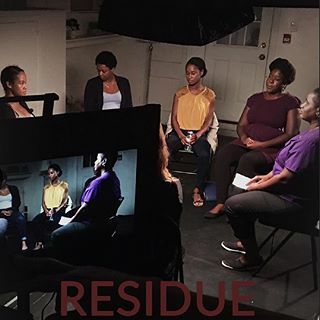 Residue is a film that follows a woman’s journey in over-coming her PTSD, after witnessing her fiance’s murder by a police officer. This narrative acts as a “How-To guide” for people dealing with losing a loved one to police brutality. By following Valerie’s life after the incident, we see the lingering issues that remain long after the hashtag has stopped trending. Shonna Foster is an actress, director, and producer based in Toronto. She is the producer of the short I Lost My Mind (2017), and has acted in a number of films. Residue (2017) is her directorial debut. Judas Noir is an adaptation of Stephen ADLY Guirgis’ play “The Last Days of Judas Iscariot”. This story follows the court trial of Judas Iscariot, the disciple notoriously known for betraying Jesus Christ. While this case gets unravelled, parallels are drawn between the persecution of the Jewish People (during this archaic time), and Black citizens of today. This play deals with themes of: betrayal, regret, forgiveness, and the loopholes that exist in our justice systems presently, and potentially in the afterlife. Judas Noir plays at Tarragon Theatre Extraspace June 13 – 18, 2017. The Olde Proverb tells the story of a young man, his ancestral counterpart and their shared fates. Beginning in 1968 at the Wake of the revolutionary Martin Luther King Jr. Marcus Garvey, Malcolm X, H. Rap Brown and Rodney King mournfully observe their fallen brother. This is mirrored in the present by 4 young men at the wake of one Marty King. An allegorical commentary, The Olde Proverb, brings life to the age old saying; Those that do not know their history are doomed to repeat it.